The texture and colour of your nails can always give a hint to your doctor about what is really going on inside your body. You can display warning signs for diseases like hepatitis and heart conditions. So, whenever there is any evidence of change, do not hesitate to seek medical advice because it could either be a sign of a disease like nail fungus or a more serious condition like leukaemia. For a long time, many people have known that their doctor could check if they are anaemic by simply looking out for pale nails. Iron deficiency can also cause the nail bed to be thin and concave and have raised ridges. Therefore, it is important for you to keep on checking your nails for any changes. It is a known fact that lupus patients, for example, will get quirky, angular blood vessels in their nail folds and psoriasis starts in the nails some of the time causing splitting and pitting of the nail bed. Heart disease can turn your nail beds red whereas a condition like obsessive compulsive disorder can also show up in the nails through nail biting or picking. Even common disorders like thyroid disease can cause abnormities in the nail beds, producing dry, brittle nails that crack and split easily. 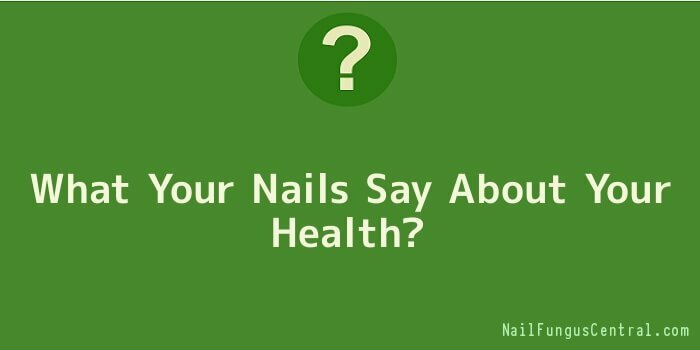 The doctor can by looking at your nails get an inkling of what is happening in your body. Even though this may not be the first sign of disease, the fact is that, there is a connection between the nails and disease. Patients will have manifested other signs of various diseases before they are finally manifested at the level of nails. For example, it would be unusual that nail clubbing was the first thing a patient with emphysema noticed. Breathing difficulty probably would have been present already. In the event that there are changes in the colour and structure of your nails, it may not necessarily be the best thing to hit the panic button. You would do yourself a great favour to try and do some elimination of simple things like bruises and all that stuff before you run to a specialist seeking for treatment.